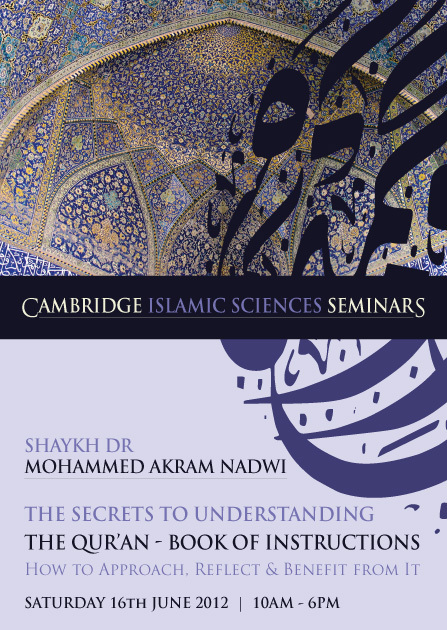 Cambridge Islamic Sciences: The Qur'an - How To Approach & Understand It? The Qur'an - How To Approach & Understand It? Firstly, the Qur'an is unlike any other book. Therefore the approach to reading and understanding the Qur'an has to be different. Realising this is critical to benefiting from the Qur'an. The Qur'an itself alludes to this in many different places. Secondly, the way Qur'an teaches and instructs is different to what we are generally accustomed to in the modern world. The Qur'an employs what Shaykh Dr Mohammed Akram Nadwi calls the "Immersion Method of Teaching" where the reader or listener is drawn in to be immersed in the context of the message. Understanding these two important differences of 1. approach/attitude and 2. methodology is fundamental to appreciating the Qur'an and benefiting from it. Sadly many of us have no clear idea about this and therefore we do not have the thirst to drink from the fountains of the Qur'an. THE QUR'AN IS THE SOURCE OF GUIDANCE. To be not drawn to the Qur'an is one of the greatest misfortunes and calamities that can ever befall us. We read and study every other book apart from the Qur'an, which is the message from our Lord to each one of us. But how can we straight thinking people do that? So this your unique opportunity to undertake this lifetime journey with a seminar on the detailed study of the Qur'an conducted by one of the most competent and respected teachers today - Shaykh Dr Mohammad Akram Nadwi. You will come out of the seminar with a brilliant framework to study and understand whole of the Qur'an in a way that may have seem impossible in the beginning. This seminar will transform your thinking! Book your place now. Why Does The Qur'an Seem Incoherent To Many Muslims?